Booking Bundle Stickers. Plant seeds and create awareness of the benefits of booking a party or show with you by putting these stickers in your catalogs, on invitations, on your literature. They are also great to put on packaging, envelopes, packages or order forms. 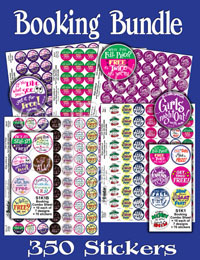 When you use these stickers you’ll find customers ask YOU about having a party. It becomes their idea to book with you. Shop from your seat not on your feet.